BRIGHTON, Mich.- While driving, have you ever noticed that your steering wheel is difficult to control, vibrating, or pulling to one side? These are just a few indicators that you probably have a problem with your vehicle's alignment, which is the way your vehicle's wheels are positioned. Why does alignment matter? Above all else, a proper alignment keeps you safe on the road, but it can also improve your gas mileage, lengthen the life of your tires, and ensure a smoother ride. Making sure that your vehicle is in proper alignment is an important part of maintaining your vehicle to keep you safe. Brighton Ford's service technician, Travis, showed us how to properly conduct a 4-wheel alignment. Take a look as he shows you step-by-step what needs to be done to ensure a straight drive. 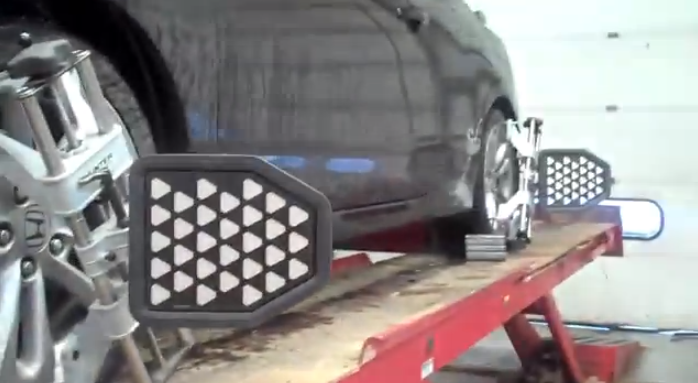 Are you concerned about your vehicle's alignment from driving on rough, pot hole filled roads? We can help you make sure that your vehicle is in proper alignment, just stop by Brighton Ford's Service Center! We can help you save on all your service needs with our Coupons and Tire Discounts.